Director of Research and Publications at the Scalabrini Migration Center and Co-Editor of the Asian and Pacific Migration Journal. 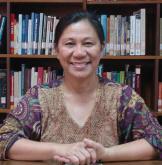 She is a sociologist who has worked on various aspects of migration and social change in Asia. Her engagement with migration stakeholders in the region have provided her with an appreciation of data issues in migration research, policy and advocacy. She coordinated a migration data project involving several Asian countries some years back. Her current research focuses on migration and development, policies and programs on children of migrant and multicultural families in Asia, and the impact of parental migration on the health and well-being of children in the Philippines.